Bramerton, which comes from the Old English meaning ‘farmstead by the bramble thicket’, is a small parish to the southeast of Norwich. The village of Bramerton is stretched along a road that runs almost the full length of the parish, to the river, where the former common was situated. There is some evidence of early occupation in the village, and several Neolithic axeheads (NHER 9878, 9880, 9881) have been found scattered throughout the parish. Fragments of Iron Age and Roman pottery (NHER 28992) have also been found, as well as part of an Iron Age terret or rein guide (NHER 30689), and a Roman coin (NHER 9681). 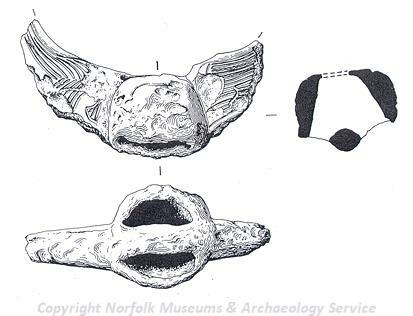 Part of an Early Saxon brooch (NHER 30689) and fragments of Middle Saxon pottery (NHER 28992) have been found in Bramerton, which was listed in the Domesday Book as a settlement of divided lordship, including an unnamed freewoman who held land in the parish. A church is recorded in the Domesday Book, and although the church of St Peter’s (NHER 4007) dates mainly from the 14th century, the presence of Caen stone and Roman bricks in the fabric of the building suggest that it replaced an earlier building. No medieval buildings have survived in Bramerton, but Bramerton Hall (NHER 4008), a large 19th century house, is thought to have been built on the site of a medieval manor house. Many early post medieval buildings are still standing in the parish, including The Grange (NHER 4006), Warren Cottage (NHER 11823) and Orchard House (NHER 24293), all of which date from the 17th century.